The last recession ended exactly four years ago, in June 2009. That means we've gone 48 months without an official recession. How's that stack up historically? 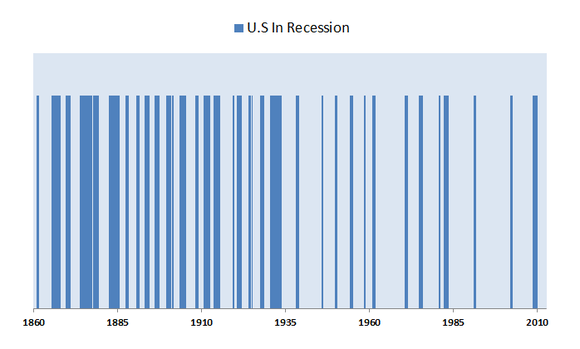 Between 1854 and 2009, the economy entered a recession on average every 38.7 months. From 1945 to 2009, recessions occurred every 58.4 months, according to the National Bureau of Economic Research. So, are we due for another recession? Probably, maybe, who knows. Averages have a lot of skew in them. Four times since World War II the economy has expanded for more than 80 months, two of which were 100-plus month expansions. We could go another six years without a recession without breaking any historical precedent. 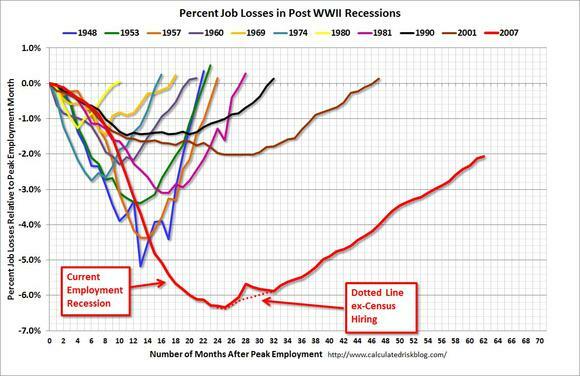 And there's at least one reason to think this expansion (technically still a recovery, since we haven't made back all the lost jobs) will last longer. There is a clear trend toward less frequent recessions over time. There are all kinds of explanations for this, the leading one being that the Federal Reserve is getting more effective at keeping the economy propped up when it hits a small speed bump. The expansion since the previous recession was at or near a record in length. The amount of time it took for employment to rebound to its previous peak after a recession came broke a new record each time. Journalist Ron Suskind told me earlier this year: "It's no different than it has been since the 1980s in the United States -- every bubble bigger, every burst a little harder to recover from." This isn't enough data to draw a firm conclusion. And if I had to bet, I think we're more likely to enjoy a boom than a recession anytime soon. But the trends are what they are. The higher they fly, the harder they fall. The article Waiting for the Next Recession originally appeared on Fool.com. Morgan Housel doesn't own shares in any of the companies mentioned in this article. The Motley Fool has a disclosure policy.